will stand in my presence." I had to chuckle when I saw this cartoon. Then it got me thinking, which promptly changed the chuckle into a lament. Remember when a man's word was his pledge? No, I don't either; that was before my time. But I've heard that once upon a time, a man's word was as good as any legal document, maybe even better. And if you really wanted to endorse the deal, a handshake was all that was needed. There was no need for signed and witnessed contracts; a gentleman's promise was worth its weight in gold. Oh, yes, those were the days! Not only are those days long gone from the business world, they seem strangely absent from many Christian circles today too. I am reminded of a time, while still in the institutional church system, where the question of children's and youth ministry workers came up. It used to be that you would simply ask any brother of sister to help in the nursery or children's program. If you got someone interested, you were happy. This time things got a bit more complicated. The church was strongly advised to have all children's and youth workers screened by the local police department first before allowing them to work with our kids. The reasoning was that, in the event something horrible happened, the church could be sued. Wow! One Christian suing another Christian? When I heard that, I was reminded of Paul's words, "If any of you has a dispute with another, dare he take it before the ungodly for judgement instead of before the saints?" (1 Corinthians 6:1). Police checks, legal contracts, and a fear of being sued ... in the church? What next? Ushers with metal detectors? X-Ray screening machines in the foyer? Then again, I suppose that for those who insist on operating the local church like a secular business, maybe that is all quite logical. Perhaps for many so-called "Christians" today, their word is no good. Maybe they do have to "Put it in Writing." How sad. We see the same sort of thing when it comes to copyrights on Christian materials. What really blows my mind is to see copyrights even on modern Bible translations. That one really has me baffled! We don't want someone to "copy" God's Word? Am I missing something here? The exception is the King James Version (KJV), since there was no such thing as copyrights back then. Then again, human nature being what it is, I'm sure someone out there would like to change that too if they could. That's ultimately it, isn't it? We're so concerned about our "rights" and our "dollars" that we don't trust anyone anymore, not even in the church. A man's word has long since become invalid as his pledge, that is, unless it also is in writing. 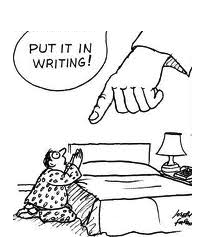 Yeah, get it in writing or face the lawsuit from a Christian brother. Am I the only one who has a problem with this? What does that say about where our heart really lies? I wonder. Paul says, "The very fact that you have lawsuits among you means that you have been completely defeated already. Why not rather be wronged? Why not rather be cheated? Instead, you yourself cheat and do wrong, and you do this to your brothers." (1 Corinthians 6:7-8). Shame on us! Have we been "completely defeated already?" Is the Gospel now a commodity for sale? Is your word your pledge? What would Jesus say about all this?